matsuli music: "I'm a Star"
"They might not have money (that goes to band leaders who, true to the power dynamics in this country, rarely redistribute) or power (which everybody knows goes only to politicians and their friends). But Mangoma and the others who produce Kinshasa's soundtrack have something else: celebrity. And in this city, where almost everything is difficult, you take any edge you can get." 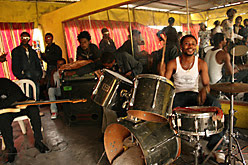 Interesting article and great short video about Kinshasa's music scene. And thats why I am headed there one day! great article (and especially the video)... i think the time is probably about right for someone to make a good full-length doc on the Kinshasa scene.